Do you live in or near Northeast Philly? 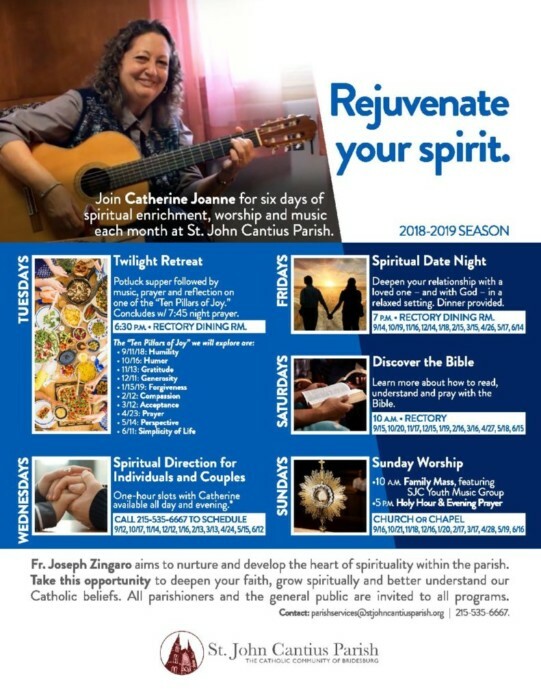 If so, consider participating in part or all of Catherine’s Spiritual Enrichment Week in St. John Cantius Parish, Bridesburg. One week each month from September through June, Catherine Joanne travels from Vermont to Philadelphia bringing a week of retreat evenings for individuals and couples, opportunities for private Spiritual Direction, a Saturday morning Bible Study, and Sunday evening Holy Hour with Evening Prayer. She also leads the music for the 10 a.m. family Mass on Sunday, which includes contemporary music, accompanied by drums, keyboard and violin. All events are free and open to the public. See the attached poster for details and call the rectory with any questions, or to set up a Spiritual Direction appointment with Catherine. Note the upcoming Twilight Retreat, Tuesday, November 13, 2018, and Couples’ Spiritual Date Night on Friday, November 16, 2018!